RNA-Seq analysis is the newest area of functionality in the Golden Helix SNP and Variation Suite (SVS) software. SVS offers a wide range of tools for analyzing and visualizing RNA-Seq data, with a particular focus on differential expression analysis. 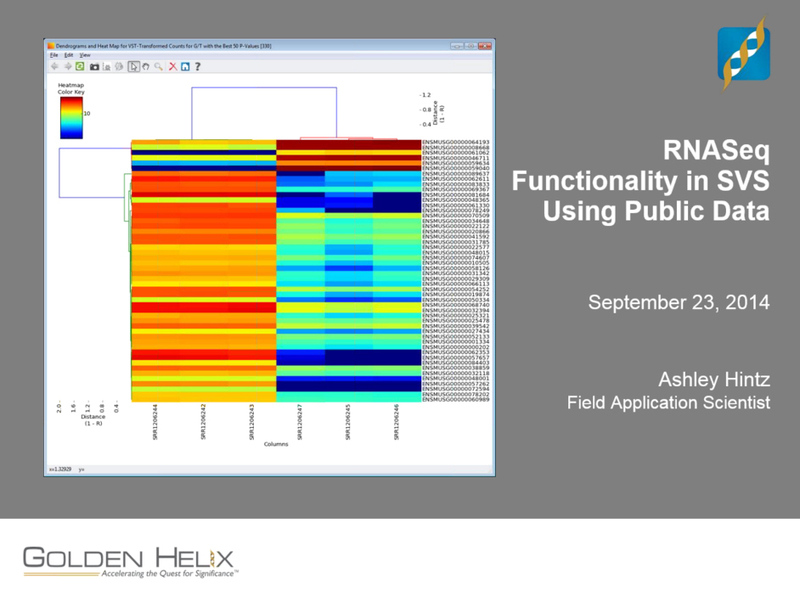 In this presentation, Ashley Hintz, a Field Application Scientist at Golden Helix will demonstrate some of these options using a mouse dataset downloaded from Gene Expression Omnibus (GEO) as a case study. Ashley will discuss available functions for data summaries and quality checks, data visualization including heat maps, interactive visualization in GenomeBrowse, and statistical methods for differential expression analysis, including DESeq. Ashley Hintz is a Field Application Scientist at Golden Helix Inc., having joined the team in April of 2014. Prior to GHI, Ashley worked at the Smithsonian Natural History Museum as a Genetics Laboratory and Museum Research Technician on a project looking into the disease ecology of African rodents and ectoparasites. She also has previous experience as a Graduate Teaching Assistant at Southern Illinois University where she attended as a Masters in Zoology student researching the phylogenetics of planigales. In her spare time she enjoys playing with her two sugar gliders and salsa dancing.